A loan of $400 helped to purchase goats and increase milk production for more increased income. Meet Mercy, a very industrious, honest, and hardworking woman from the Siongiroi area of Kenya. She has been farming for the past seven years. Throughout the years, she has gained a lot of experience and is considered among the best farmers in her village. She has been practicing mixed farming. Her primary sources of income have been milk (goat and cow), crops, and some small business ventures that help her make ends meet. Mercy is very passionate about farming and loves cultivating her farm. That is why she wakes up very early every day to go plow her farm. Milk is the most demanded commodity in her village, despite its shortage. Mercy's primary challenge has been the low production of milk, which affects her income. 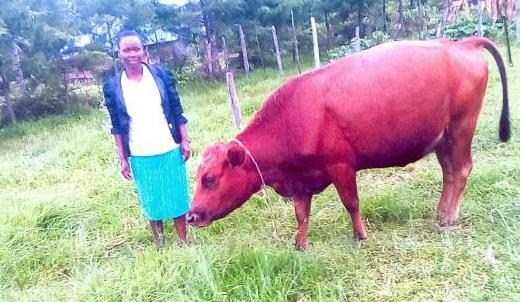 She has requested a 40,000 KES loan from Juhudi Kilimo to purchase goats and increase her milk production. She will buy good breeds of goats that are heavy milk producers, disease resistant, and tolerant to harsh climatic conditions. The extra income from this loan will help Mercy to pay the school fees for her children. In the future, she would like to expand her dairy farming by acquiring more dairy goats.